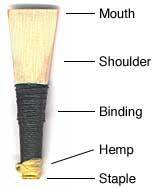 This page is intended as a primer to the basic parts, types and use of a bagpipe chanter reed. This page is available translated (not by me) into German as a PDF file, this was the November 14, 2001 version of this page which has minor differences. Shoulder. This is the area across the central portion of the exposed cane. On a ridge cut reed, the shoulder is fairly pronounced (see below). Staple. At the base of the reed is a cylindrical/conical piece of metal, typically copper or brass that provides a support for the rest of the reed. (If you are lucky, might get to see an old reed with a staple made of silver.) The staple opening is round at the bottom and elliptical at the top. The staple is a soft metal because sometimes it is desirable to alter its shape and, consequently, also the reed's sound. This alteration is accomplished with a tool known as a mandrel (see Modifying Chanter Reeds). Sound Box/Throat/Tone Box. This is the space inside the reed that is located between the top of the binding and the shoulder. Edges. The two long sides of the blades are considered the edges. The mouth of the reed is not typically referred to as an "edge." This is an example of a "molded" reed. Notice the gradual taper from the binding to the top of the reed. Due to their shape, a molded reed's blades get most of their support from the staple. Molded reeds are more common. This is an example of a "ridge cut" reed, rarely also referred to as "french cut" reed. Notice the distinct step at the shoulder, though not all ridge cut reeds are quite this obvious. The blades of ridge cut reeds get the most of their support from their thick base. These reeds are less common. As a chanter reed is played, it will absorb moisture. This moisture will soften the cane, which normally would lower the pitch, however there's a second effect on the reed. When played, a reed experiences air pressure upon it, forcing it to close up, which raises pitch. (This is evidenced by the fact that a reed will rise in pitch on a bellows-driven set of pipes, which is absent of any moisture change and also by the fact that if you overblow a reed it will close completely and shut down.) This means that if a piper picks up a set of bagpipes and tunes the drones to a relatively dry/unused chanter reed, the drones will be out of tune after a brief time (5-15 minutes usually) as the chanter reed pitch rises. One might think that it would be advantageous to keep the reed very moist—eliminate one variable, so to speak—perhaps by leaving the chanter attached to the bagpipe bag. However, moisture is a catalyst for mold growth. Mold breaks down a reed and will greatly reduce its life span. Consequently, most pipers remove their chanters from the bag and use a "reed cap" (sometimes called a "chanter cap" or "dry stock") to protect the reed while it is seated in the chanter. On the other hand, if your reed is still developing mold while in the reed cap, more air circulation would be wise. Drill a few holes in your reed capmore easily done with a home-made PVC model. Later if your reed is drying out, some or all of these holes can be sealed with tape. In some extreme cases of constant high humidity (such as the tropics), you may find that even air circulation is not enough and reeds have to intentionally dried with exposure to gentle heatbut be aware that this is not necessary for the vast majority of climates. Some pipers find that a chanter reed cap with a built-in moisture stabilization system (such as the Piper's Pal), will keep their chanter reed "just right" and ready to go. A reed maker that I know swears that it's the cycle of drying out then rehydrating that shortens a reed's lifespan. I have no good reason to dispute that. A specialized cap should help keep a reed's moisture content more stable. Some pipers say that such a cap makes little noticeable difference to them. As with most things with piping, there are claims either way. This an example of a commercial reed cap. These typically sell for around $12-$20. Avoid ones with a metal bolt as the bolt can rust. This home-made version is constructed of PVC pipe, Teflon tape, and a plastic bolt from a hardware store. The parts cost under $1. It took about 20 minutes to make, plus tools including a tap & die set to thread the hole for the bolt. Made by Kinnaird Bagpipes, this cap maintains a constant moisture level for your reed. These sell for around $35, give or take. Tip for Reed Caps: When you put on your reed cap, pick a reference point and always tighten the bolt in that same location—for instance, above the High-G hole. If you don't, you will gradually compress a ring in the hemp that holds your chanter into its bag stock, resulting in a loose chanter. In short: "In/up, out/down." Lowering the chanter reed into the chanter shortens the distance between it and the holes in the chanter and raises the pitch. Raising the reed lowers the pitch. Changing the quantity and position of the hemp on the binding will affect where the reed seats. (If a chanter has a consistent problem with the reed seating too high the reed seat can be reamed out a bit; a task not to be taken lightly.) If the bottom of the staple is in direct contact with the reed seatwith no hemp acting as a cushionthe pitch of the reed will be raised even more than you may expect. Whatever you do, you want the reed seated very firmly as a loose reed will be flat and irratic. Some pipers opt to tap (create threads in) the read seat in the chanter which allows the reed to rise or sink by merely twisting the reed to the right or the left. This relationship is useful when setting up a solo chanter with a new reed. (In a band, the new reed must be set to match the pitch of the "master chanter," so this is irrelevant.) What follows is the basic procedure. Go back to 2 and repeat until low-A and high-A are in tune. *Sharp notes can be made flatter by placing a piece of tape (most common is electrical tape) over the top portion of the corresponding hole. Make sure the tape is even across the hole—not angling from one side to the other. This will reduce the volume of this particular note slightly, but is an extremely common practice. More on tuning individual notes. Some notes are easy to tune, High A and E for instance. Many pipers have the most trouble with F. Tune as best as you can against a tuned tenor drone then play a tune that you know well and hear how it sounds. If a note sounds out of whack, then it probably is. If you are not sure if a note is sharp or flat, put your finger a little over the top of that hole and listen. If it sounds better, then the note is sharp and needs tape, but if it sounds worse, it's flat and you'll probably have to either sink the reed to sharpen that note and tape the holes above or perhaps carving the top of that hole of your chanter. (But be very careful carving, it can be a slippery slope, best trod with the boots of experiencesee my article Carving Bagpipe Chanters.) Or you sometimes you can simply modify the reed, see the next section. Why would someone alter a chanter reed? Maybe it requires the wrong pressure or it doesn't sound right. Almost all manipulations are made on new reeds. For my page on scraping, sanding, pinching, etc. visit Modifying Chanter Reeds. So how to you know if a reed is dying? It will tell you. A "blown out" reed will begin to behave erratically: notes will be right one moment and way off the next, a G gracenote might honk before correcting. To quote the movie Ghostbusters: "Cats and dogs living together—mass hysteria!" It may be hardly noticeable at first. A note that acts weird every few days or simply after playing a long time. Gradually it just gets worse until you decide to replace it. This page last updated Tuesday, February 7, 2012.